Garage door springs are the coiled steel parts featuring above the door or along the horizontal section of tracks in each side of the door. The ones above the door are called torsion springs and they are installed to turn on one end and remain still at the other end. This movement creates torque and enables the production of high force, which allows the movement of the door. The side springs are called extension springs and they stretch every time the door is shut. As the coils are stretched, there is enormous tension stored which is released when the door must open. As the coils contract, the door opens. The importance of springs is great because they enable the movement of the door. Though, they need attention because the sudden release of their power might lead to accidents. Garage Door Repair Brandon recommends the avoidance of interference with springs to all clients. Spring repairs might involve dangers since they can easily snap if they are not handled the right way. We have the best technicians at our company. We have great knowledge of all springs and can easily evaluate their condition. We excel in garage door torsion spring adjustment and will be there to ensure the good balance of the door. When the springs lose their tension overtime, they will need adjustment. Springs determine the balance of the door and that's why well-adjusted springs ensure well-balanced doors. You can depend on Garage Door Repair Brandon for all spring needs. Our spring experts are not only effective in all spring services but also fast. We make sure urgent problems are dealt with as soon as possible. 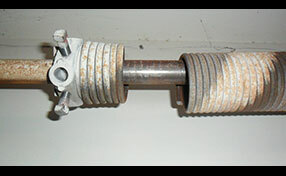 We will replace garage door extension springs and the broken torsion spring and install the perfect new ones. Our replacement and installation services are excellent since they are performed by specialists who have been in the garage door repair field for years. We guarantee quick repair services and excellence in our work because we are exceptional professionals and know the significance of springs. If you have any questions about garage door springs, don't hesitate to call us.